Extinction of Experience: Does it Matter? Right after I graduated from Cornell University, I took off for the North Cascades wilderness. First as a student and later an instructor for the National Outdoor Leadership School, I spent summers in Glacier Peak Wilderness Area. I ice climbed out of crevasses, backpacked through Pacific Northwest old growth forests, and scaled ancient volcanoes. For me, this was true wilderness. 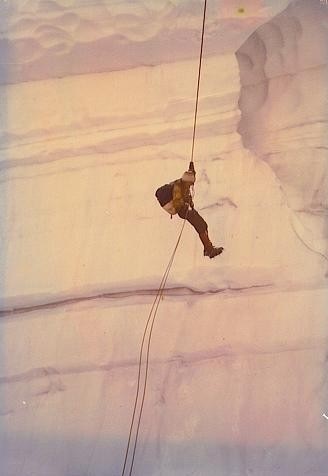 Author rappelling into a glacier crevasse in the North Cascade Mountains. In my early 30s, I moved back to Ithaca, NY. Initially, I did not appreciate the rural upstate New York landscape--compared to the North Cascades, the wild spaces were tame and pockmarked with rundown houses. But years later, I have come to find solace in nearby nature. In winter, I gaze up at ice-veiled waterfalls and ski along frozen creeks. In summer, I do my work-outs along the creek banks, soothed by the sound of flowing water. Still, compared to the North Cascades, these are but slivers of nature among neighborhoods. At night, they are bathed in city light. Have I become victim to "extinction of experience?" As cities and metastasizing suburbs forsake their natural diversity, and their citizens grow more removed from personal contact with nature, awareness and appreciation retreat. This breeds apathy toward environmental concerns and, inevitably, further degradation of the common habitat....So it goes, on and on, the extinction of experience sucking the life from the land, the intimacy from our connections... people who don't know don't care. What is the extinction of the condor to a child who has never known a wren? Domestic, everyday, local nature... is ... only half of what we need to flourish, as individuals and as a species. The other half that we need to keep alive--in our experiences and in our language--is the importance of wildness, of places that are large in scope, self-organizing, and unbounded, ... and of interactions that can be grand and awe inspiring and also frightening and difficult. But, for many living in cities, Kahn's wildness--"the other half that we need to keep alive"--is unattainable. Are city dwellers simply out of luck--not able to flourish? Tim Beatley, a professor of sustainable communities at the University of Virginia, attempts to answer the question about how declining access to nature in cities might impact our well-being. The nature pyramid, modeled off the food pyramid, suggests that to keep healthy, we may need not only the everyday, small doses of nearby nature to keep us healthy, but also the occasional intense, immersive experience in wild nature. For me, the opportunity to traverse glaciers, summit peaks, and hear the trill of the Swainson's thrush reverberate from its perch in towering old-growth, was a peak experience--it enabled me to flourish. But 20 years after I left the Pacific Northwest to come back east, I had another experience that also has enabled me to flourish--this time in the Lower East Side of Manhattan. Like my North Cascades experience, my Lower East Side experience was a nature experience--but it was embedded in human culture. It was my first visit to a community garden. On one side of the garden was a mosque used by Bangladeshi immigrants. The men, dressed in long kurtas, had carried with them not only their faith but also their intercropping traditions. They were growing amaranth, pigeon peas, flowering coriander and marigolds in raised beds in New York City. For me, the cultural aspects of this experience were more powerful than--yet still connected to--nature. The immigrants were creating a sense of community through connecting to nature--creating civic ecology practices to support people and nature. 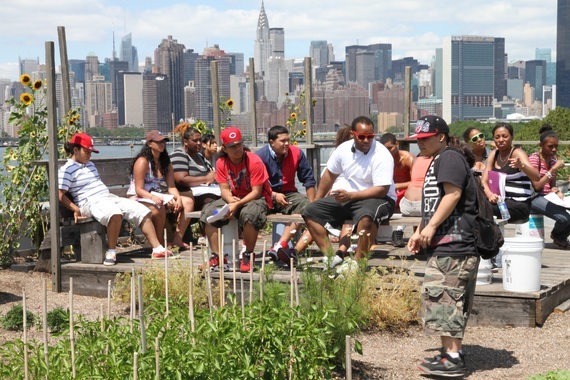 For me, community gardens are cultural spaces that emerge in cities, that connect to nature, and that enable the spirit to flourish. Here is my dilemma. I know that even if my children were to go on a mountaineering expedition in the Glacier Peak Wilderness, their experience of wildness would be different than mine. They would experience human impacts--contaminated stream water needing to be treated, glaciers retreating, species invading--all of which I was unaware. Although some may claim that my children's experience would simply be different, to me, it would be diminished. But does this matter? If our concern with extinction of experience is related to health, as the nature pyramid suggests, then I am less worried. I believe that urban places, perhaps especially the chaotic, self-organized places represented by community gardens and civic ecology practices more broadly, create new experiences that enable us to flourish. But if our concern, like Pyle's, is about what we want to conserve, then we may need to embrace an urban reality. People in the future may work passionately to save a different kind of nature--a nature in cities that celebrates human's caring for our environment and our communities. And whose acts of caring offer their own richness of experience. An earlier version of this essay was published on The Nature of Cities blog.